Bump up your gift presentation this year with 2 easy styles of bows: the fancy, “fluffy” ones shown above and the perfectly tied simple bow shown below. I learned how to make the fancy gift bows from an unusual person: a college boyfriend that was a rough and tumble cowboy type. Weird I know! His mom owned a décor store that he worked at part time so he became very good at it. I have absolutely no memory of why he taught me this skill, but it sure has come in handy over the years! Next, I refined my bow tying while working for Tiffany & Co for nearly 5 years. All employees (except the maintenance people and security guards) are required to know how to tie the signature TCO knotless elegant bow. On the rare occasion that a box gets wrapped as well, they also have perfected tapeless papering. I’ll confess this skill has decreased for me over the years but I could probably do it on a smaller box in a pinch. The bow however is a skill I will never lose! • For an elegant tree presentation, you do not need to make every single bow/box super fancy; I personally prefer a bit of variance and originality between boxes and often favor mostly simple, elegant bows with a few of the puffy, elaborate bows thrown in for impact. • Sticking to a general palate based off your tree’s decorations will look best. For example, my tree this year is mainly white, rose gold, copper and pewter so I chose creamy white, copper and pewter wrap and ribbon. • If your kids still believe in Santa, I’d suggest wrapping all Santa gifts in a single design of wrap and not use it on other gifts that year. They’ll forget the wrap the next year so you can finish the roll of later. • If you have a pretty gift box (like the ones Nordstrom gives out) don’t bother wrapping it. Unless the color of it totally clashes with your plan, save yourself time and just change out the bow if you want to notch it up a bit or just leave their pretty band and simple bow. 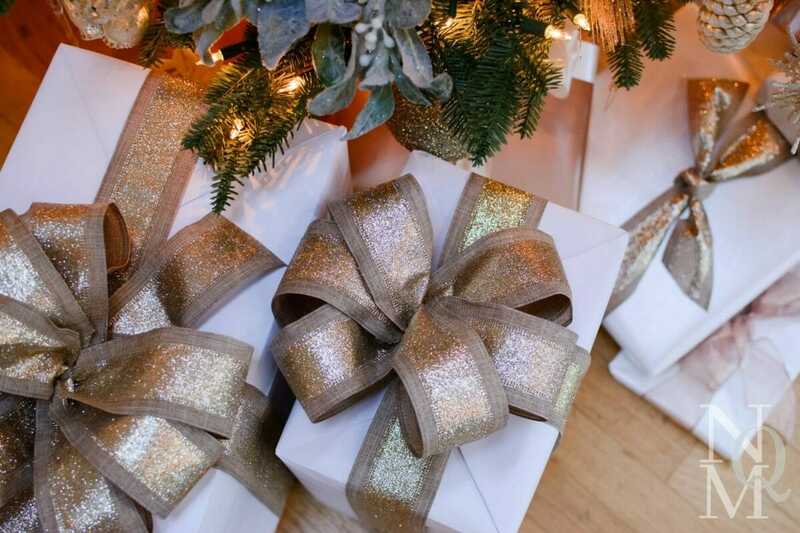 • Any size box can feature either style but before picking which type bow to make, consider the scale of the box, width and type of ribbon, color and pattern of wrapping paper. • Some people prefer wired ribbon and while I like it and use it often, it’s not always the best choice. It does make the fancy, puffy style bows quite a bit easier to do though and since you use a lot of yardage making this style bow, wired is often going be a better value than higher quality plain double-faced satin. • Double faced satin ribbon is definitely the best for elegant, simple bows – just like Tiffany uses. If ordering online, be sure to read the description carefully. I’ve been very disappointment on occasion when something looked like satin but arrived and was the stiff, old school plastic-ish ribbon. • To conserve ribbon just loop around the box one time and tie a nice, larger simple bow. Or perhaps just a stylish knot. • I like the idea of using cute picks like gold leaves, Christmas ornaments, candy canes and the like; but in practice I often don’t bother. A beautiful bow kind of says it all for me unless it’s a very special occasion or present. • If you want to add something, try adding a sprig of pine or rosemary and a sweet tag to elevate the box. They’re basically free and super easy. Happy wrapping! Giving gifts is so much fun! Relish the moment and the recipient’s expression on the big day! The below fancy bow tutorial is great. My end steps are a little different though. I do not use a different, thinner ribbon to tie it but instead use the same ribbon, and at the stage of folding the loops in half, I often a single angled cut at the fold which create little v-shaped notches (instead of the slits she does) because they make the ribbon lay better in my opinion. Her way is probably best though with extra wide or stiff ribbon so try both ways out to see what you like best.